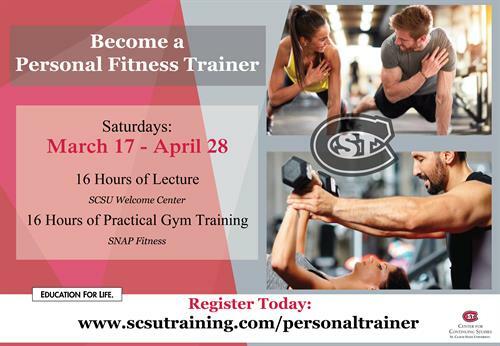 Level 1 - Nationally Certified Personal Trainer: Successfully complete the written and practical exams. CPR/AED required. Saturdays - Mar. 17 - Apr 28. The $735 cost includes the testing fee for the original test date, $699 if registered/postmared by Mar. 3. Those cost for the CPR/AED is $810, $774 if regsitered/postmarked by Mar. 3.